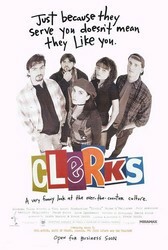 Clerks can sort of be looked as the proof of faith and hard work, proof of constant man hours to put together a dream that could just either kill you or bankrupt you, and Kevin Smith did exactly that, he put all his credit cards and life savings on the line for this movie, and he created anClerks can sort of be looked as the proof of faith and hard work, proof of constant man hours to put together a dream that could just either kill you or bankrupt you, and Kevin Smith did exactly that, he put all his credit cards and life savings on the line for this movie, and he created an astoundingly authentic and human comedy that deservedly started his career. We follow Dante, (Brian O'Halloran) who has had to go and work in his local convenience store on his day off, and we basically follow his daily routine of working in retail, dealing with customers, but also dealing with his own personal grievances with his love life and his care-free best friend, Randall (Jeff Anderson). Randall works in the video store next door, and couldn't be more bored with listening to the typical customer, something which he doesn't hide in front of them. Dante, on the other hand, spends most of the film debating whether to meet up with his ex-girlfriend, all the while being annoyed at the sexual conquests of his current girlfriend. What makes this film so enjoyable and real is the dialogue and perhaps a little exaggerated situations that these two hapless workers find themselves in, selling tobacco to underage children, having fussy customers, having difficult customers, all in a days work. Where the true comedy lies though is with Randal, whose interesting topic of the Star Wars saga is sheer comedy at its best, simply because its ordinary to think these things, there is no big-budget comedy writer to insert some mediocre quip for cheap laughs, but genuine, albeit ridiculous, scenarios where the best of us I'm sure have found ourselves in. The cast of characters is big and great; the script starts very well; but then it is not so good till the end where it gets brilliant. All the F*** movie is hilarious, it's f**** great, I can't believe this f**** s**** I can't wait to see more movies of this f**** clerks universe. 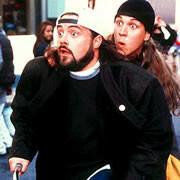 While the acting is average at best, you can't deny Clerks has some worthwhile and laugh-out-loud moments. 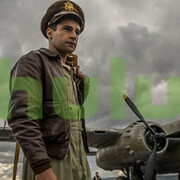 Maybe overrated by a bit, but still a worthwhile movie to watch. Probably Kevin Smith's best film but that is like saying this is my favourite cancer. Boring, pretentious and too wordy without saying anything. Laughs are few and far between. Only a director this self indulgent could bring us films like Dogma and Gigli.